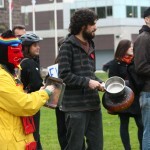 On Wednesday evening, there was a Quebec Student Solidarity Rally/Casserole Night. 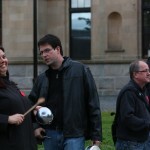 With a crowd of about 50 in front of the New Brunswick Legislature, people brought pots and pans to make noise. The crowd moved to the edge of the lawn, by the road, to allow the Blogger opportunity to participate. Students in Quebec have been protesting the government’s plan to raise tuition over the next five years. This has been ongoing since February 2012, with the culmination being an ongoing protest and the passing of Bill 78. This bill restricts freedom of assembly, protest, or picketing on or near university grounds and anywhere in Quebec without prior police approval. 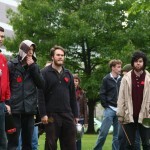 I agree with the students in Quebec, protesting the raising of tuition fees. I have close to $60,000 in student loan debt, of which a portion dates back to the previous millennium. I have two degrees to show for this debt, but as I am not working for pay in my fields of study, it makes it difficult to understand what I did in university. I am working in a job that doesn’t require a university education. I don’t regret the education I have sought and obtained. I do regret the student debt incurred. And without the opportunities in New Brunswick to make better wages, my student loan debt remains an albatross on my finances. Excellent coverage. Wonderful that the protesters moved the location so that The Blogger could hear and record. I am not knitting my own RED SQUARE, which I will wear in support of Democracy which is eroding daily, in this Province and in this Country.